It was easy to overlook the issues in the original Zombieville USA. When it hit, the App Store was as foreign and exciting as our new iPhones. Plus, there was no real measuring stick; we just knew it was a fun and cutesy side-scrolling shooter starring the world’s favorite bullet-sponges, the undead. Zombieville USA 2 [$.99], on the other hand, has released in a period where we have expectations. Awesomely, Mika Mobile knocks them out of the park by both refining and creating within the confines of the original game. Tightly-constructed, well-executed, charming, different and entertaining are all words I feel like I can freely use when describing Zombieville 2. For the most part, it’s a near perfect iterative entry to the franchise. It artfully hones in on and turns up the volume on the two best parts of the original: the shooting and upgrade models. Zombieville 2 just gives you more — more zombies, more weapons, more people to play as, and more to unlock as you rummage through levels collecting cash from boxes and other environmental items. The upgrade model in particular is a killer. Like a modern Call of Duty, this game has a tendency to inspire constant replays, as the next best weapon or character perk is always just a few more sessions away. 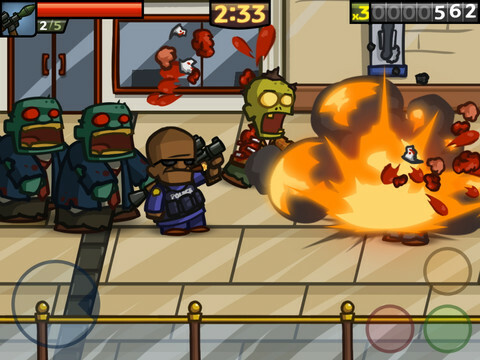 A smarter Xbox-like button system allows for up to three weapon switching on the fly, while the harder-hitting melee weapons ensures you’re never up the proverbial creek and unable to defend yourself against the zombie hordes that populate each of its cutesy, though still post-zombie armageddon environments. 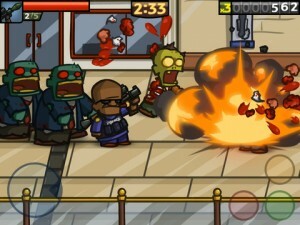 Zombieville 2 introduces several key changes, including a huge out-of-game item store. For me, the most impfactful change is its re-moldeled structure. Levels are now instance-based and timed and you move between them freely. For the most part, the free-form appeal of the action has been retained. Whatever you do during your time in a level, be it running steadily to the right or staying put, is up to you. This puts everything that happens on your terms — you pick the weapons, you pick the approach and you choose how and when to kill. You probably won’t come out of the action with a ZombieVille Moment to share with friends since the core model isn’t all that interesting from a strictly mechanical run-and-gun standpoint, but you’ll end up molding your own strategies or tactics inadvertently. A lot of weapons in the game have varying amounts of knock-back or cause adverse side-effects on the undead, allowing you room for more sandbox-y and satisfying play. You can meet your undead, uh, death quota with a friend, too. A Game Center co-op mode adds a second player to the action via Bluetooth or online. The core action doesn’t pop like you think it with more than one dude pummeling zombies due to schizophrenic spawns, but it’s a welcome reprieve to doing it all by yourself. Most sophomore efforts in a franchise just see incremental refinements to what made the game a success enough to spin it off in the first place. While you’ll see a lot of that with Zombieville 2, there are some great and impactful changes to check out, as well. If you had any doubts, stop. This is a stupid-fun game with some sharp features and systems that’ll keep you invested and having a good time.